He kept Sarpi informed of his progress and Sarpi arranged a demonstration for the Venetian Senate. They were very impressed and, in return for a large increase in his salary, Galileo gave the sole rights for the manufacture of telescopes to the Venetian Senate. It seems a particularly good move on his part since he must have known that such rights were meaningless, particularly since he always acknowledged that the telescope was not his invention! That something finally arrived, in the form of the new invention then spreading across the European continent - the telescope. 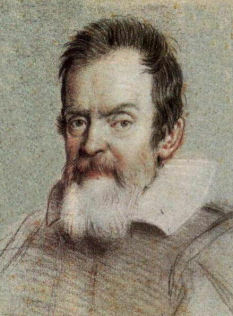 Of course, being Galileo, a man who's life had till that time been devoted to the "working science of things" (one will remember that he was a "most respected instrument maker") it would have been out of character for him not to have employed the telescope for more than just tangible gain, and so he did. In 1609, in Padua, Galileo pointed his telescope towards the Moon, thus becoming the first to employ the new instrument to observe and document the celestial object. At left are seen a pair of refracting telescopes owned by Galileo courtesy © WGBH/NOVA website. Galileo's star was about to rise to the highest echelons within the european scientific community and over the next twenty years, 1610-1630, his life, livelihood and character would change. 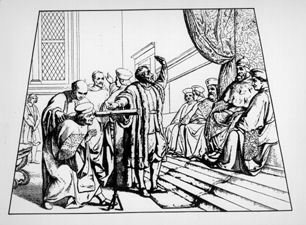 Yet, at the same time, Galileo's ascent would manage to bring together, for better or worse, two separate and divergent trains of thought, scientific and spirtual, to the point of historic confrontation, causing a rift between science and religion that would last well into the 20th century. Meanwhile, in the early part of 1609, a comtemporary of Galileo was making his own mark on science. 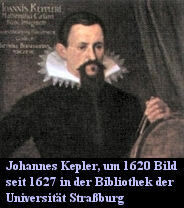 In that year a German named Johannes Kepler published a work under the title New Astronomy, and within its pages were Kepler's first two laws of planetary motion (the thrid would not arrive until 1618). 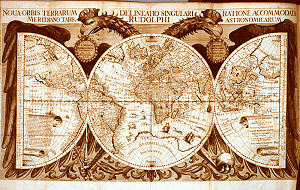 Over the succeeding years, both men would independantly pursue research (though Kepler's theoretical work at this time was ahead of Galileo's) that would eventual become the foundations that merged much of the scientific knowledge up to that time into modern theoretical and physical astronomy. Who was Johannes Kepler and what were his contribution to science are the subjects of our next chapters. Shown at left is an image of the German mathematician, astronomer and astrologer Johannes Kepler, considered one of the important leading figures in the 17th century scientific revolution. Image courtesy The Einstein Website, © Hans-Josef Küpper. Shea, William R. and Artigas, Mariano - Galileo in Rome - The Rise and Fall of a Troublesome Genius, Oxford University Press Aug. 2004 ISBN13: 9780195177589 ISBN10: 0195177584 Link is to the BNet Brief  "Galileo's trial by the Inquisition is one of the most dramatic incidents in the history of science and religion. Today, we tend to see this event in black and white--Galileo all white, the Church all black."